On the lead single off his forthcoming compilation LP, ‘Timeless Music,’ Long Island producer BP The Neckbreaker laces grimy strings and slapping drums for “Stacking Ammo,” a hard-hitting collaboration featuring Wu-Tang affiliates, Frukwan and 9th Prince. The track represents the first we’re hearing from the beatsmith’s 18 track compilation album, which boasts a slew of notable guests including late rap legends Sean Price and Prodigy. And on “Stacking Ammo,” BP displays his affinity for crafting joints that perfectly match the tough talk and wordplay of the extended Wu family. 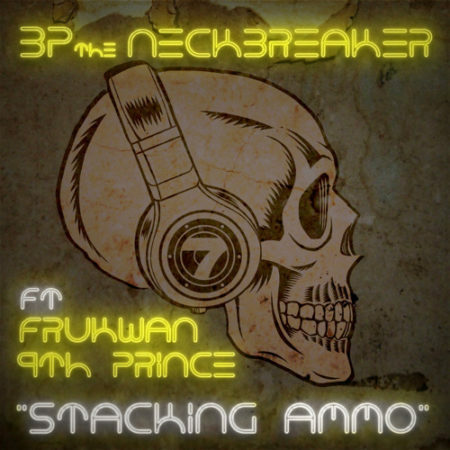 Frukwan (of Gravediggaz) and 9th Prince (of Killarmy) previously joined forces on the latter’s One Man Army album, and “Stacking Ammo” continues the tradition of these two sounding like they need to record a full album together…immediately. Their back-to-back verses are raw and full of quotables, all of which sound even better thanks to BP’s bone-chilling production. “Stacking Ammo” is now available for stream. Be sure to mark your calendar’s for next Friday’s release of Timeless Music, which will be available through BP’s own label, Common Virtue Records.